Compare some of the best online department stores using our customer satisfaction ratings. ^ Price compared to other online retailers. # Price compared to bricks and mortar retailers. 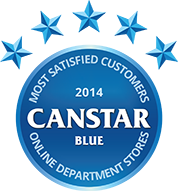 Canstar Blue research finalised in April 2014, published in June 2014. Also in these latest results, we determined which online retailers resonated the most with Australian consumers. This year, we found that shoppers were most satisfied with DealsDirect.com.au, earning this brand our Most Satisfied Customers Award – Online Department Stores for the third year in a row. They even made a clean sweep of five star ratings in all but one of our criteria! “…Over (sic) three quarters of Australia’s 15.4 million internet users made a purchase or order over the internet (in 2012-2013).” This is an increase from 2010-2011, where only 68% could say the same. Also rated were oo.com.au, Grays Online, and the online storefronts of Big W, Kmart, Myer, David Jones, and Target. Notably, oo.com.au secured five stars for its price compared to other online retailers, price compare to brick and mortar retailers, its range of products, and the speed of its delivery. How does your online retailer stack up? Read through our results breakdown to find out. DealsDirect.com.au secured the five star spot for overall customer satisfaction in this category, ahead of four star achievers oo.com.au and Target. David Jones, Kmart, Big W, Myer, and Grays Online all finished with three stars. Customers who shopped at DealsDirect.com.au were most satisfied with the price they paid for their online purchase. Following this brand were four star recipients oo.com.au and Target; then three star recipients David Jones, Kmart, Big W, Myer, and Grays Online. The online experience usually means shopping around at various retailers to find the best price possible. oo.com.au excelled for its prices compared to other online retailers, earning the brand five stars. Not far behind were DealsDirect.com.au, Target, and Big W with four stars each; then three star recipients Grays Online, David Jones, Myer, and Kmart. Customers of two particular online retailers were most satisfied with how competitive their store was on price, compared to brick and mortar retailers: DealsDirect.com.au and oo.com.au. Each brand received five stars, and was followed by Target and Big W with four. Hot on their trails were three star recipients Grays Online, Myer, Kmart, and David Jones. DealsDirect.com.au customers were most satisfied with how easy it was to find the products and services they wanted from the online store. Next in line following the five star achiever was Target and oo.com.au, both of whom received four stars in this area. David Jones, Kmart, Big W, Myer, and Grays Online all received three stars for ease of website navigation. Both oo.com.au and DealsDirect.com.au excelled for the range of products they made available on their website. Each site received a five star rating; Target finished with four, and David Jones, Kmart, Big W, Myer, and Grays Online all achieved three. A robust variety of brands is just as important as a wide array of products. DealsDirect.com.au earned our top rating once again, followed by four star recipients David Jones, Target, Myer, oo.com.au, and Grays Online. Kmart and Big W came next with three. How quick does your online purchase arrive after ordering? DealsDirect.com.au and oo.com.au customers were most satisfied with the promptness of their deliveries. Each brand secured a final five star rating in this category; David Jones, Target, and Big W all received four, and Myer, Kmart, and Grays Online achieved three each. Canstar Blue commissions Colmar Brunton to regularly survey 2,500 Australian consumers across a range of categories to measure and track customer satisfaction. The outcomes reported are the results from customers within the survey group who have made a purchase from an Australian online department store in the last 12 months – in this case, 913 shoppers.